SOLD - The Kindred Ranch, named in honor of the generations of family that have lived on the Ranch since its homestead claim in 1908, is set in the dramatic intersection between the striking Rocky Mountain Front to the west and the vast grassy prairies rolling to the eastern horizon. 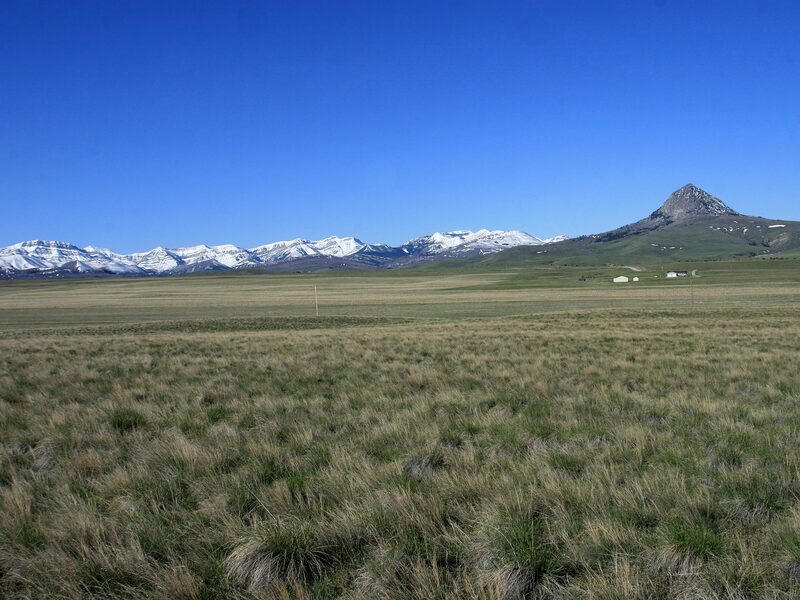 The tranquility and dramatic views from this 635± deeded-acre ranch represent an opportunity to own a recreation, agricultural or equestrian property in a very desirable Montana locale. Elk Creek, a healthy private trout stream, flows through the Ranch for about ¼ mile with mature stands of cottonwood, aspen and willow trees that create a wildlife-rich riparian corridor. 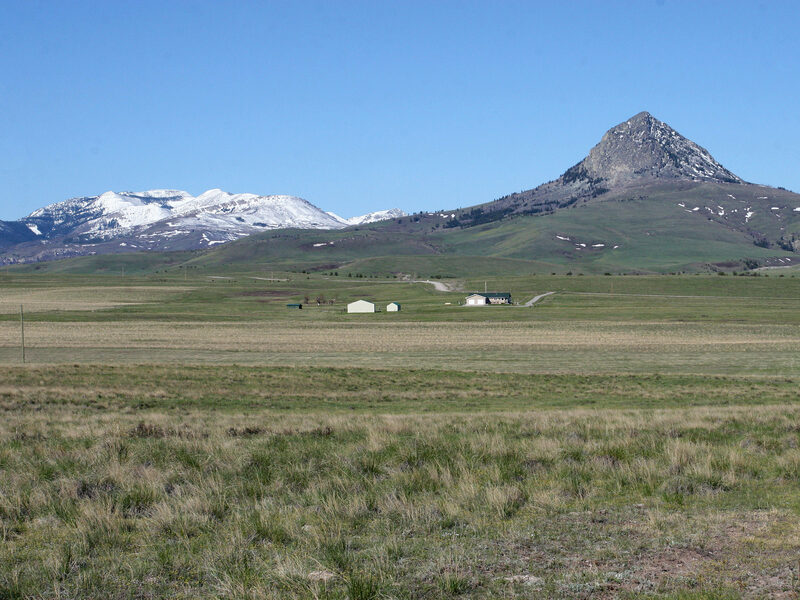 The improvements on the Kindred Ranch have been completely updated and capture the spectacular views of Haystack Butte, Steamboat Peak and the Front Range, yet maintain the connection of over a century of family history on the Ranch. The original 1908 homestead cabin still stands in the Ranch headquarters as a quiet sentinel to the family anthology. This impeccably maintained Ranch offers the opportunity for comfortable year-round living or as a seasonal escape to enjoy the cool evenings and long temperate summer days that are perfect for horseback riding, fishing and hunting in this premier Rocky Mountain location. Devoted anglers will appreciate that the famed tail-water stretch of the Missouri River below Holter Dam is a comfortable hour’s drive from the Ranch – within easy striking distance when one of the legendary hatches are coming off the river. The wildlife and recreation opportunities on the Ranch are further enhanced by the adjoining 6,400± acre parcel of State Land and the millions of acres of nearby Forest Service and Wilderness lands. The Ranch is ideally suited for a gentlemen’s ranch or a nice-sized horse operation. Several attractive locations exist to construct a small set of working corrals and riding arena. The lush native pastures are well suited for maintaining several saddle horses or a small herd of cattle for the summer months. With limitless trail riding opportunities out your back door, the next owner could enjoy years of exploring the back country of The Bob Marshall Wilderness Area and the thousands of acres of public land that border the Ranch. 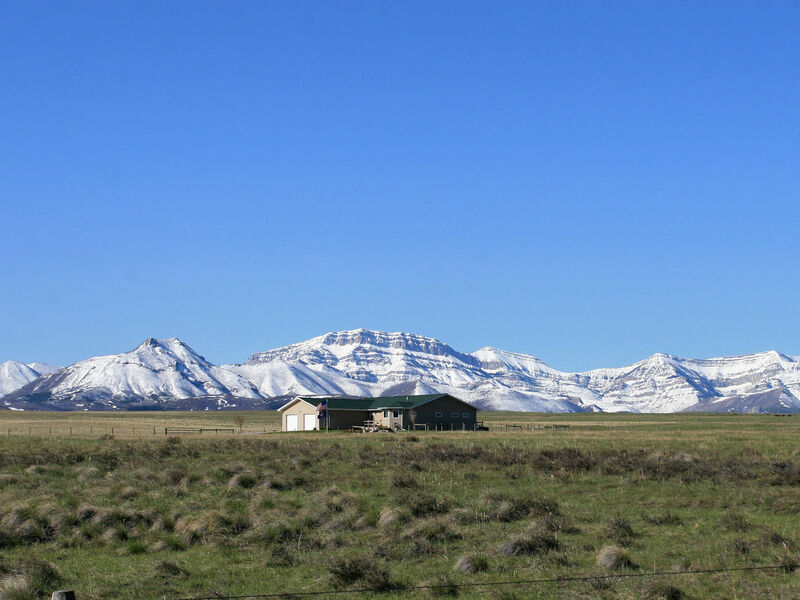 The Kindred Ranch compound is easily accessible and conveniently located off of Elk Creek Road about 7 miles southwest of the small agricultural community of Augusta – locally known as the Gateway to the Bob Marshall Wilderness. Great Falls, the closest urban center, is a comfortable hour drive from the Ranch and provides commercial and private airport services. The Kindred Ranch is located in Lewis & Clark County about 7 miles southwest of Augusta on Elk Creek Road, which is accessed off the paved Highway 435. Choteau is about a half hour’s drive northeast of the Ranch and Great Falls, the third largest city in Montana, is a comfortable hour drive to the east from the Ranch. The capital city of Helena is about 75 miles to the south. Driving from Great Falls to the Ranch, take Interstate 15 north to State Highway 200 at Vaughn. Follow Highway 200 west to Simms where the highway divides and bear west on State Highway 21, then slightly south on US-287 towards Augusta. Drive south out of Augusta on Hwy 435 for 6.7 miles and turn right on Elk Creek Road for .8 miles to the Ranch entrance. Driving from Helena to the Ranch, take Interstate 15 north to Wolf Creek, and then exit onto Highway 287 North. Follow 287 to Augusta, then go south on Highway 435 for 6.7 miles and turn right on Elk Creek Road for .8 miles. Known in Montana as the “Electric City,” Great Falls is the commercial and banking hub of north central Montana. With a population of approximately 60,000, Great Falls offers a complete and diverse array of retail, dining, supply and equipment services. The Great Falls Clinic Medical Center also provides quality health care and surgical services. Malmstrom Air Force Base, located just east of Great Falls, is home to the 341st Missile Wing, one of three U.S. Air Force Bases that maintain and operate the Minuteman III intercontinental ballistic missile. Augusta offers limited services which include a gas station, grocery store, post office and several cafés – a classic Montana ranching town. 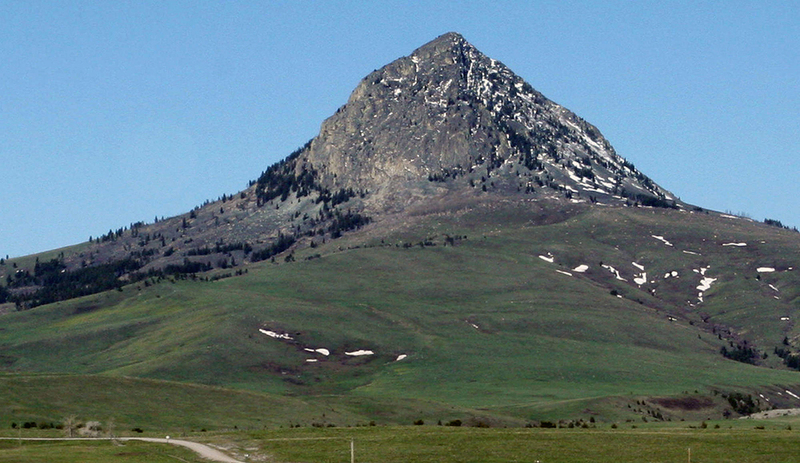 Choteau, the Teton County seat, sits about 30 minutes to the north and provides a larger range of services. 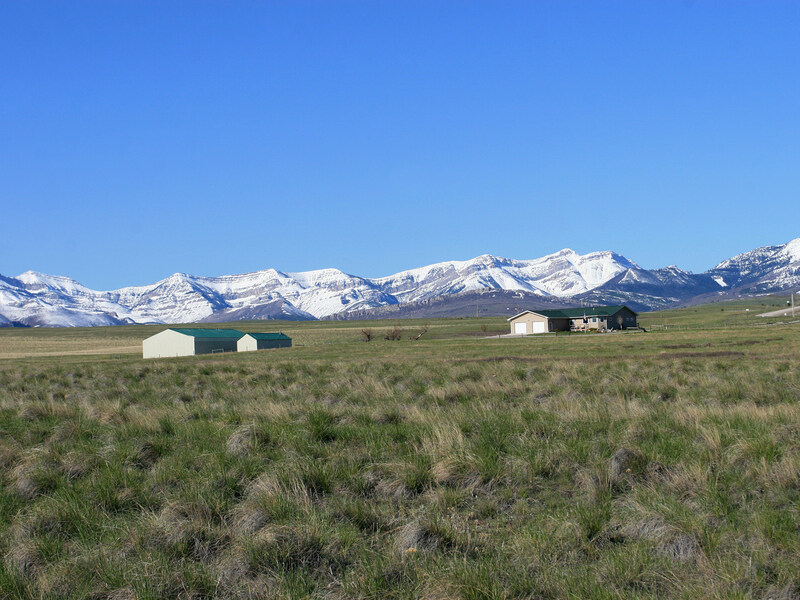 A well-maintained public airstrip is situated on the northeast edge of Choteau. Located at an elevation of 3,942', the 75' x 5,000' asphalt runway is in good condition. Communications for this facility are available through Salt Lake City at Frequency 133.4/285.4 (Great Falls RCAG). Families can expect their children to receive a high-quality kindergarten through high school education at Augusta Public Schools. Students from the surrounding community experience the unique educational environment of the small-sized multi-grade classrooms. The high school is classified as a Class C school (under 160 students) by the Montana High School Association and provides a great learning environment and competitive interscholastic athletic programs. School bus service provides round-trip transportation for elementary and high school students in the area. The Augusta community has traditionally been very supportive of the school system and has regularly supported school bonds for capital improvements and upgrades. The local area is primarily comprised of agricultural operations interspersed with recreational landowners. 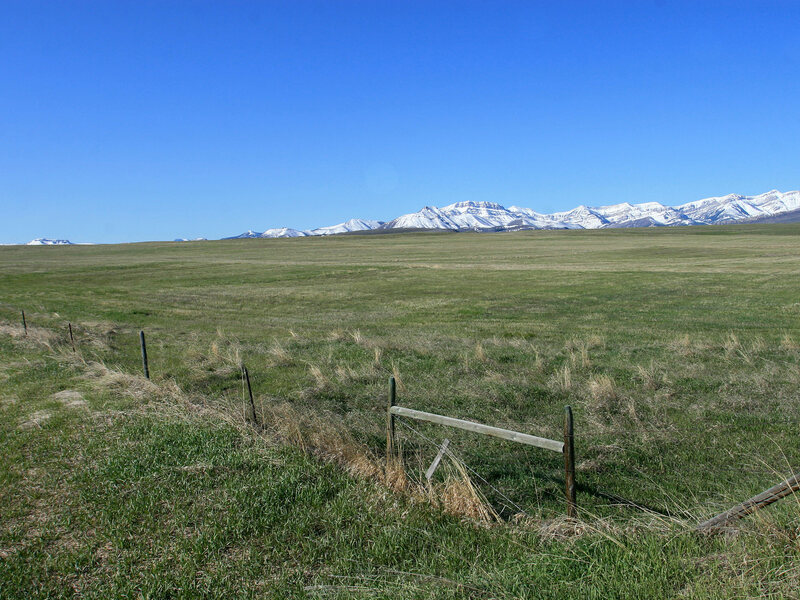 The topography of the Kindred Ranch can generally be described as rolling foothills, prairie and pasture with a strong influence from the Rocky Mountain Front. The majestic panorama of rugged limestone peaks, sheer walls, towering reefs and deeply-cut canyons provides a mountain viewscape like nothing else in North America. Elk Creek creates an abundant wildlife corridor as it flows through the Ranch with mature cottonwood and willow trees creating a stunning riparian bottom with Haystack Butte towering in the western sky. The riparian corridor creates an environment that is dramatically different than the open rolling pasture, dry-land crop and CRP acreage that comprise the majority of the Ranch. The Kindred Ranch encompasses approximately 635-deeded acres of which 370± acres are enrolled in a Farm Service Administration / United States Department of Agriculture (FSA/USDA) Conservation Reserve Program (CRP). 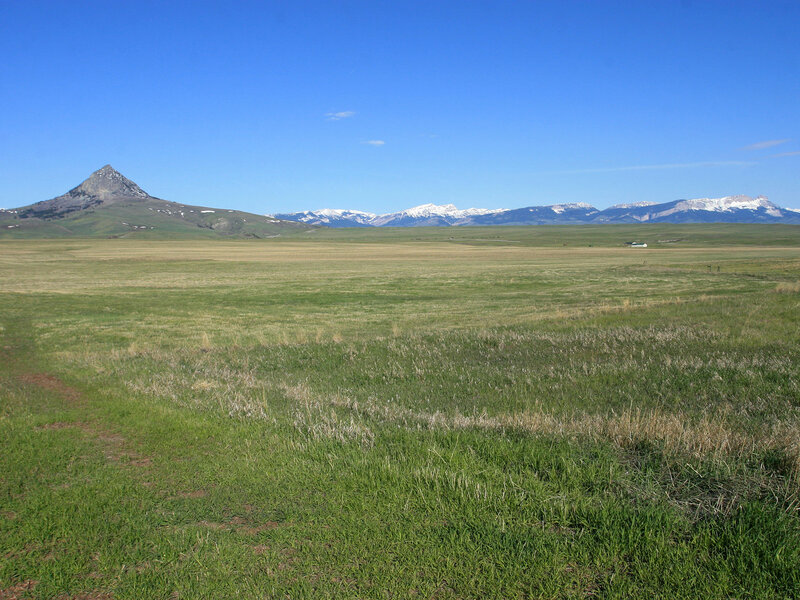 This CRP acreage generates an annual payment of $9,265.00 to the owners. This CRP contract could be assumed with FSA/USDA approval and would generate immediate cash flow for Buyers. Buyers could also negotiate termination of the CRP contract and revert the land to the historical uses of dryland farming and grazing. There are currently two verbal leases on the Ranch for annual cattle grazing and a honey bee colony. The Sellers will convey with the Ranch 50% of whatever mineral, oil, gas, geo-thermal, hydro-carbon and gravel rights it actually owns, subject to reservations by previous owners. The Sellers make no representation as to the quantity or quality of any mineral or other subsurface rights appurtenant to the Ranch and independent investigation is highly recommended. The Ranch sits at an average elevation of approximately 4,400 feet above sea level. Due to the surrounding mountains the weather can change rapidly and The Front is known for occasionally extreme weather events. The average annual precipitation is 14 inches, with the majority of this amount coming as rainfall occurring in April, May and June. The average growing season in the area is approximately 93 days with frosts ending in early June and beginning again in September. The average high temperatures in June, July and August range from 72° to 81° Fahrenheit and average summer low temperatures range from 45° to 51°. In December, January and February average high temperatures are between 32° and 41° and minimum temperatures typically range between 11° and 16°. There is plenty of sunshine throughout the year and winters are typically open, even with frequent snow storms. All of the improvements on the Ranch, including interior and perimeter fencing, are very well maintained and appear to reflect no large future deferred maintenance expenses. The current residence was built in 2005 on the location of the original Kindred Ranch family home and was perfectly positioned to capture the views of Haystack Butte and the dramatic Rocky Mountain Front. The home has been impeccably maintained and contains 3 bedrooms, 2.5 bathrooms and an attached oversized 2-car garage that features a built-in gun safe. The comfortable design of the single-level home features an open kitchen and great room, with oversized hallways and doors for easy movement and traffic flow. The master bedroom has a private bathroom with steam shower and a generous walk-in closet. The home is nicely appointed with GE appliances, Rinnai hot water system and forced-air heating/air-conditioning. The landscaped yard designed with attractive plantings and a flag pole incorporated into one of the beds is easily maintained with the underground irrigation system. There are two outbuildings that are able to comfortably accommodate all of the Ranch storage needs. Both have been updated with new siding and green metal roofs to compliment the main home creating unity in this attractive and perfectly maintained Ranch compound. The larger outbuilding is a free-span 40' x 80' pole barn that has a full concrete floor and a generous 10' x 20' roll-up door to accommodate easy access for equipment and vehicles. The smaller ‘Granary’ building has a concrete floor and authentic wood stove which was re-purposed from the original family home. The historic ‘Granary’ building would make the perfect environment for a wood or leather shop or recreational pursuits like fly tying or re-loading ammunition. The original homestead cabin on the Kindred Ranch was built in 1908 by Mathias Reichert and still stands proudly on the Ranch compound today. Electricity is provided by Sun River Electric Cooperative based in Fairfield. Telephone service is provided by Three Rivers Communications. Water for the home is provided by a domestic well, and the water for the barn is supplied by a stock well. The residence is on an individual septic system. Annual electric costs typically run about $1,118 and propane has historically been approximately $1,986 per year. The taxes on the real estate and improvements for 2013 were $3,220. Elk Creek, a small-stream fishery for brown, rainbow and cutthroat trout, runs through the Ranch for approximately a ¼ mile. The riffles, runs and deep pools of the creek make for very enjoyable wade fishing and the fish are typically very receptive to well-placed dry flies, nymphs and streamers. The majority of the fish are in the 10-14" range, but several large brown trout over 20" have been caught and the current creek record approaches 28". The bordering State parcel allows anglers to continue fishing upstream and provides a great opportunity to explore new water. Devoted anglers will also appreciate that the famed tail-water stretch of the Missouri River below Holter Dam is a comfortable hour’s drive from the Ranch and the Dearborn and Sun Rivers are even closer. This part of the state is well known to hunters. There are numerous and varied big game and bird hunting opportunities on the Ranch and in the surrounding areas. The upland-bird populations in the area include Hungarian partridge, pheasant and sharp-tailed grouse. The CRP creates an ideal upland-bird habitat. 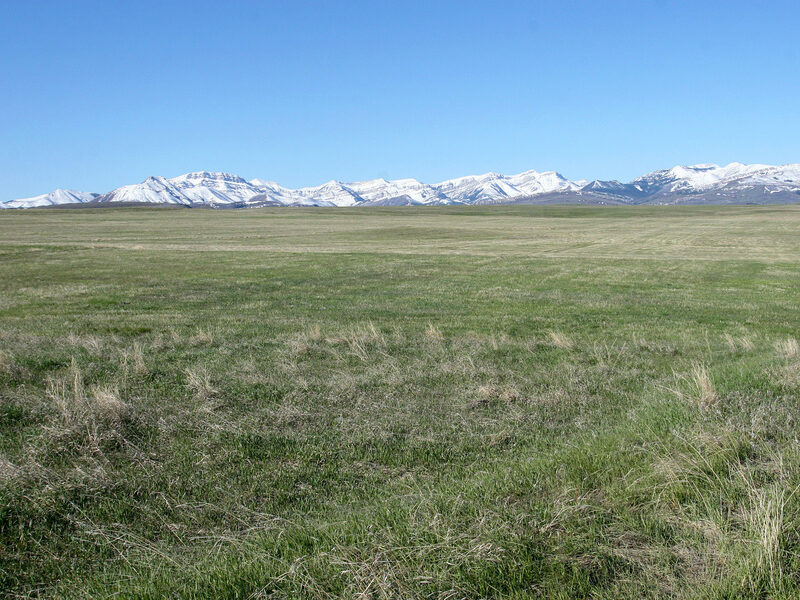 Modifying some of the Ranch pastures to include grain or food plots would certainly enhance the upland-bird populations and create a significant draw for waterfowl traveling the Pacific and Central Flyways. 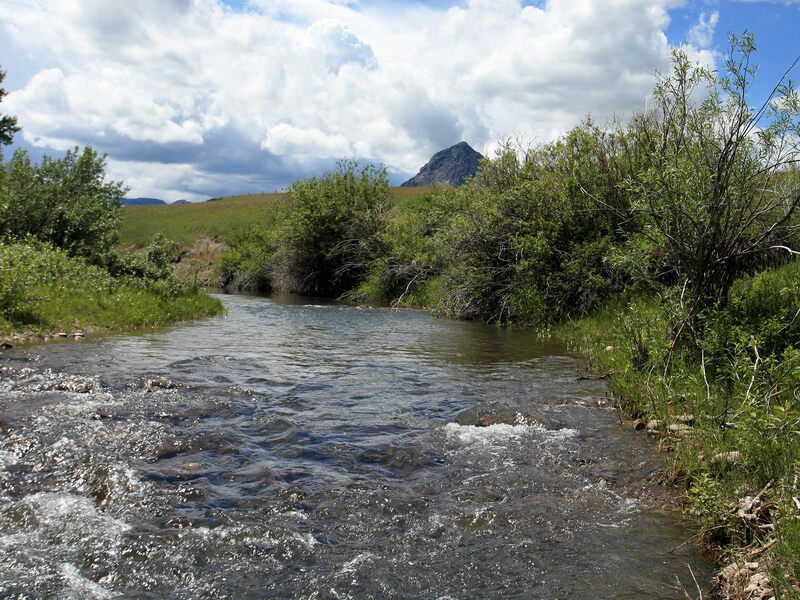 The lush riparian habitat along Elk Creek provides great cover for wildlife which is apparent through the consistent numbers of whitetail, mule deer and antelope on the Ranch; elk, moose and bear also frequent the Ranch upon occasion. The nearby National Forest, Sun River Game Range and Wilderness areas are open to hunters with some restrictions. The Ranch is located in Montana FWP hunting District 422. Specific information regarding hunting regulations, resident and non-resident license applications and permits are available through the Montana Fish and Game web page at http://fwp.mt.gov/. 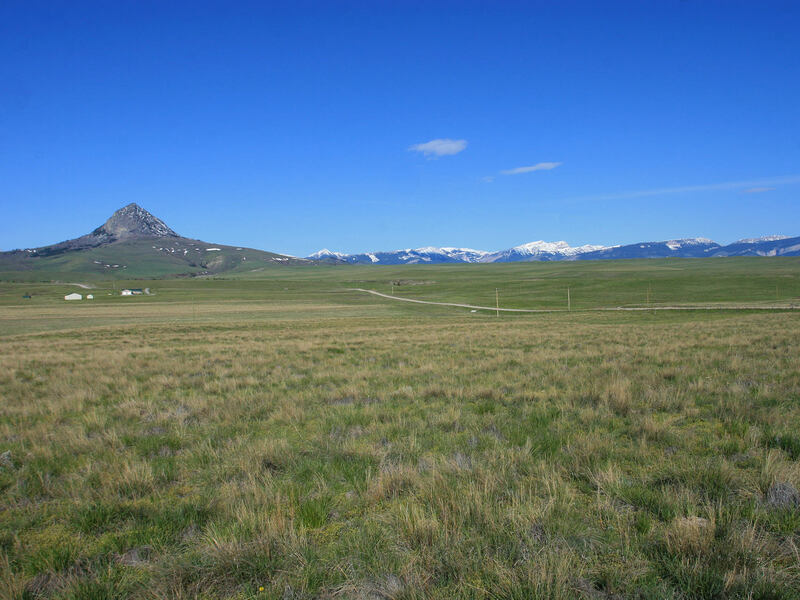 The outdoor amenities of North Central Montana are abundant and fulfill the prerequisites of any recreation enthusiast. The Bob Marshall Wilderness Complex situated just west of the Ranch is comprised of 1,535,352 acres. “The Bob” is the fifth largest wilderness area in the United States. Its sustained beauty is due in part to the Wilderness Act of 1964 which prevents any roads or structures from being created as well as motorized or mechanical equipment not being allowed in the area. The Wilderness is accessible by foot or on horseback through its abundant trail system. Hunting, fishing and camping are all allowed with the proper permits. Wildlife within the area includes grizzly and black bears, moose, elk, mountain goat, bighorn sheep, wolverine, wildcats and lynx. To the northeast of the Ranch, near the town of Fairfield, lies Freezeout Lake. This Wildlife Management Area offers hunting, fishing and wildlife viewing and is also the primary staging area for snow geese on their spring migration from the Gulf States. In early March as many as 300,000 snow geese and 10,000 tundra swans gather at the Lake to rest before continuing to the extreme northwest Arctic Coast of Canada. Positioned between the Pacific and Central Migratory Fly Zones, the mountains tend to push migrating birds east thus creating tremendous waterfowl hunting opportunities with the massive migratory populations. Fairfield offers golfing at the Harvest Hills Golf Course with a beautiful backdrop of the Rocky Mountain Front. Golfing is also available at the Choteau Country Club, and Great Falls has several notable courses including Anaconda Hills, Meadowlark Country Club and the new Eagle Falls Golf Club. For many decades, travelers have journeyed down the Missouri to see the inspirational rock formations and limestone cliffs. Scenic boat tours are available to enjoy the beauty that has changed little since the days of Lewis and Clark. To gain additional knowledge of the “Corps of Discovery” Expedition and the history of the area, it is well worth visiting the Lewis and Clark Interpretive Center in Great Falls which offers lecture series, films and exhibits. Located about an hour from the Ranch and west of Choteau, Teton Pass offers both winter and summer recreational activities. With an annual snowfall of approximately 250 inches, this cozy resort offers varying terrain for skiing and snowboarding. In the summer, the amazing views can be enjoyed by hiking and biking the various trails. Each year on the last Sunday in June, the American Legion PRCA rodeo takes place in Augusta. For over 75 years, the community has hosted the oldest and one of the largest rodeos in Montana, which draws the top rodeo cowboys and cowgirls from around the nation. This annual event featuring a parade, Old-Time Wild Cow Milking and rodeo creates an exciting family affair. In the 1860s cattlemen were arriving in this area to take advantage of the prairie grasses to feed their herds. Before the disastrous winter of 1886-87, it is said there were more than half a million cattle in the immediate vicinity. In 1889 Montana became a state, and four years later in May of 1893 the town site of Augusta was surveyed and dedicated. It was named after the first child born in the town, Augusta Hogan, daughter of an early rancher, D.J. Hogan. The neighboring town of Gilman, which thrived from 1912 until 1932, has faded into the sunset like many small frontier towns in Montana. The original homestead cabin on the Kindred Ranch, which still stands today, was built in 1908 by Mathias Reichert. Mathias was born in Ettlebruck, Luxembourg, and worked his way to the American West on the railroads and was hired on as a ranch hand on a cattle operation near Augusta in the early 1900’s. During this time he filed a homestead claim on 120 acres of the current Ranch. He left for a short time, but the appeal of Montana drew him back to the area. Mathias and his wife Cecilia and their daughter Susanne returned to the homestead and lived in the historic one-room cabin, while building a larger home. Susanne later married Gilman Mirehouse – the namesake of the town of Gilman, being the first white-child born in the town in 1912. Their daughter, who was raised on the Ranch, has returned to her roots and lives on the Ranch today with her husband. The small western town of Augusta is the gateway to the immense Bob Marshall Wilderness and the adjoining Scapegoat Wilderness. The “Bob” was named after Bob Marshall – an early forester, conservationist, and co-founder of The Wilderness Society. In 1941 this region was set aside as the South Fork, Pentagon, and Sun River Primitive Areas, and in 1964 it was designated as wilderness area when Congress passed the Wilderness Act. The wilderness area extends for 60 miles along the Continental Divide and consists of over one-million acres. Although there are no paved roads within the area, there are 1,700 miles of trails that are accessible only by foot travel or horseback – a backpacker’s paradise! Adjoining The Bob to the east is the Gibson Reservoir. Although the initial deliberations about the Gibson Dam began in 1907, construction did not start until 1926, in part due to its remote location. Even then the nearest railroad was still 23 miles away in Augusta. Gibson Dam was the first American dam to be analyzed and designed according to the trial-load method. The trial-load method relies on mathematical equations to determine stresses and strains acting on a dam. This method would later be used in the design of the Hoover Dam on the Colorado River. Gibson Dam, an imposing, concrete half-moon, standing 199 feet high with a crest length of 960 feet, is able to store 99,000 acre feet of water in its reservoir! Its base is approximately 117 feet wide and tapers to 15 feet wide at the top. Construction of the Dam was completed in 1929, and it was the last of the major irrigation projects in the Sun River drainage. 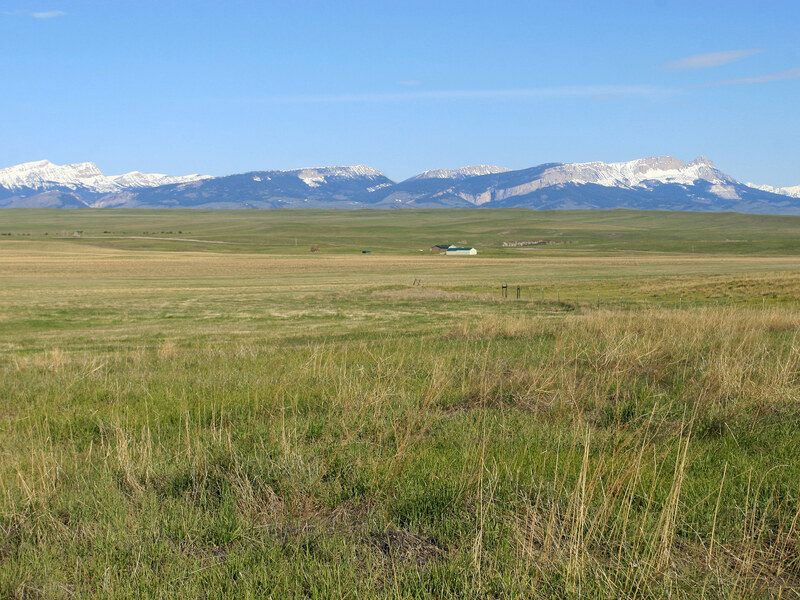 The Kindred Ranch enjoys a premier location along the Rocky Mountain Front, one of Montana’s most desirable locales, and is graced by stunning views and extensive recreational opportunities. The privacy and sense of authenticity this area provides are highly coveted to those seeking solitude away from urban America. 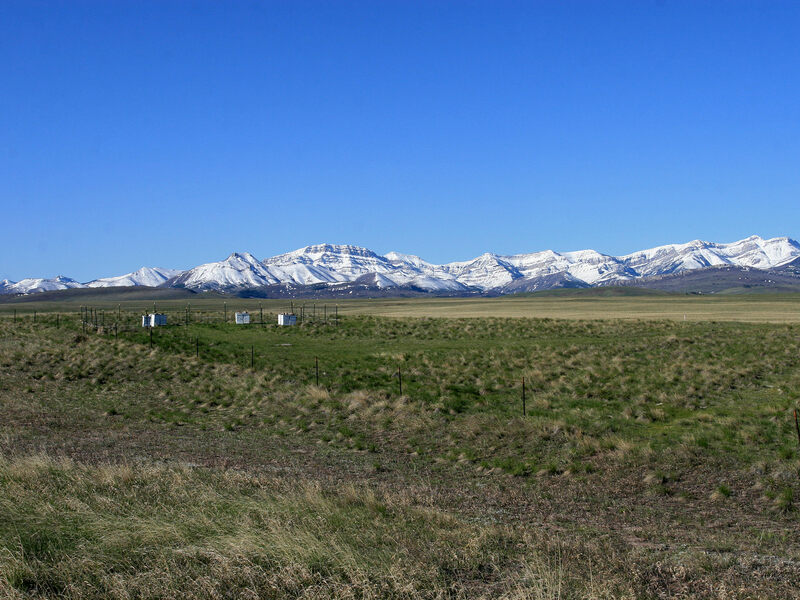 The fishing, hunting, recreation and equestrian opportunities on the Ranch and the direct access to the vast trail systems of the nearby Scapegoat and Bob Marshall Wilderness Areas make this a very attractive Ranch. The current owners live on the Ranch full time; however ownership can be kept very simple and is one of the many attractive attributes of the Ranch, thus allowing one to enjoy all that the Kindred Ranch has to offer seasonally without the dynamics of more complex agricultural units. **There is a list of personal property and equipment that could be purchased via separate Bill of Sale..